The LA Marathon is a big event in this city, and not just because it's a 26.2-mile race full of pro and amateur runners alike. The course is long and difficult to navigate due to road closures—oh, and about 25,000 people run it every year. If you think you can just show up to a random patch of sidewalk on Santa Monica Boulevard and spot your cousin who may or may not be wearing a blue shirt (light blue? bright blue?? long sleeve? tank top?!) you'll probably end up disappointed. Fear not, though. 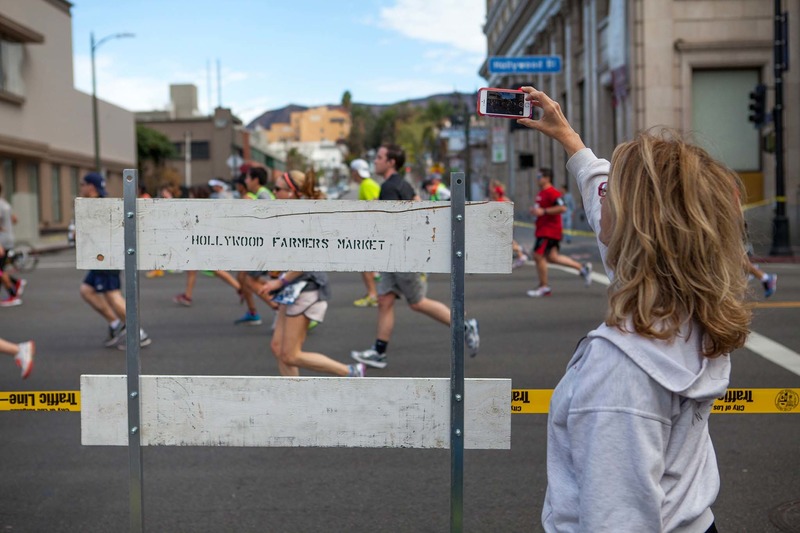 Here are some lessons about finding runners in the LA Marathon that we've learned the hard way. 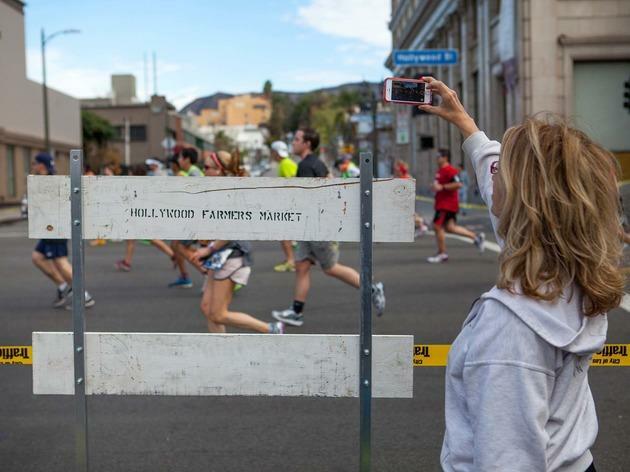 (While you're at it, here are the 10 best places to watch the LA Marathon). Don't bother going to the start line. Simply put, there's not much to see except a lot of anxious runners and a lot of shiny Mylar blankets. You're much better off spotting your runner during the race. So drop them off and head to the course (or breakfast). Make a plan. A very specific plan. This may seem really obvious, but let us tell you: if you don't make a super specific plan before the race, what will become really obvious to you is all the important information you didn't discuss with your runner before the race started. Read on to learn what you and you runner should know before race day. Decide on a place to look for each other ahead of time. This is important because the LA Marathon is 26.2 miles long. If your runner doesn't know where you're going to be, at some point, he or she is probably just going to focus on the race instead of searching the crowds for you. You're much more likely to see each other if you both start looking for each other at the same place. Also, pick a place that you can actually get to: if you live above Sunset, it will be difficult to get to a spectating spot on Rodeo Drive because of road closures. Speaking of road closures, read up on those right here. Make sure you show up where you agreed to be. There's only so much a runner can think about and remember on race day: "Am I drinking enough water? Is that a calf cramp creeping up on me? How much longer is this thing? This seemed like a good idea at the time... Oh, what I wouldn't do for a beer right now... BUT WAIT, MY FRIENDS ARE WAITING FOR ME AT MILE 19! I have to get there!" If your runner is having a tough day, the promise of seeing their personal cheering section is probably what's keeping them going. The only thing more devastating and soul-crushing than race-day, um, indigestion is when your family and friends are nowhere to be found where they promised they would be. Don't do that to your runner. If you really can't be there, make sure you send a text and buy at least two rounds at the finish line. Pick a landmark and stay there. Landmarks can be anything from a building to a business to a mile marker. 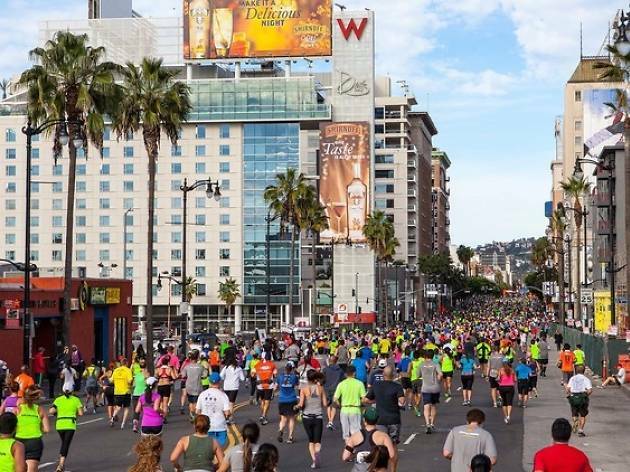 Take a look at the LA Marathon course map and decide where you want to be. 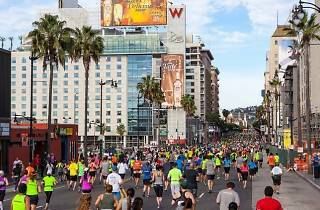 Or, pick one from our list of the 10 best places to watch the LA Marathon. If you want a shot of your runner speeding down the Walk of Fame/Rodeo Drive/Sunset Boulevard, we're all for that. Pain is temporary, but badass photos are forever. Here's what you say: "Runner, I'm going to be in front of the El Capitan Theater on Hollywood Boulevard. It's past the mile 11 marker, just past Hollywood & Highland, and it's on the south side of the street." No way will your runner miss you, especially if he or she is looking for you (see above). Do not say: "We'll see you in Beverly Hills." Because you won't see them in Beverly Hills, guaranteed. The LA Marathon starts at 7am, but unless your runner is a pro athlete, he or she won't be crossing the start line until around 7:30am, or even later. There are about 25,000 people running this race—it will take a while for all of them to cross the start line and there will probably be enough time for your runner to text you when they're getting close to actually starting. A helpful way to predict when your runner will actually start is to know their pace. If they average a 10-plus-minute mile, they'll be towards the back. Once you know that, you can estimate when, for example, a 12-minute-miler will get to mile 8. Know what your runner is wearing. Make sure you know what your runner is wearing on race day—even better, ask them to take a photo of their outfit, from hat to shoes, all laid out the night before the race. If it's a chilly day or you're planning to meet up with them in the first couple of miles, keep in mind they might be wearing layers. If it's a really hot day (which it looks to be this year), your runner might be shirtless or stripped down to a sports bra. Also, make sure your runner knows what you're wearing, and if you'll be holding a sign. Don't try to meet up too many times. Like we've said, 26.2 miles is a long way and it's also a lot of roads to close on a Sunday morning in LA when—let's face it—the majority of this city isn't expecting it. The LA Marathon isn't exactly the Boston Marathon (which is more or less a city-wide holiday) or the NYC Marathon. It's difficult to drive around on marathon day, so don't promise your runner that you'll be in too many places. Pick one spot, maybe two if you're sure you can get there, and then the finish line. Make a very specific plan on where to meet up at the finish line. Remember those 25,000 people that ran the race? Each of them has at least one or two people who are planning to meet them at the finish line. That's 75,000+ people who are milling around Santa Monica, and a third of them are sweaty, tired and very much in need of a beer. Cheer everyone on—not just your runner! This should be obvious, but please be every runner's cheerleader while you're out on the course! Every single person running the LA Marathon is going to need little pick-me-ups throughout the race. Even if it's just a simple "looking strong" or "keep it up," offer encouragement and smiles and high-fives. The only thing you should never, ever say to a marathon runner is "you're almost there." The only exception to this is if they are actually almost there—like, they are so close, they can see the finish line.